River Valley junior Layne Fitch connects on a three-pointer to start the game, during the Raiders’ 46-45 victory on Friday in Bidwell, Ohio. MHS sophomore Bobby Musser (left) goes up for a shot over RVHS senior Jarret McCarley (0), during the second half of River Valley’s 46-45 victory on Friday in Bidwell, Ohio. BIDWELL, Ohio — He finished what he started. River Valley senior Layne Fitch — who hit a three-pointer for the first points of Friday’s Tri-Valley Conference Ohio Division boys basketball contest in Gallia County — also scored the final points of the game, hitting his sixth trifecta as time expired to give the Raiders a 46-45 victory over visiting Meigs. The Raiders (1-5, 1-2 TVC Ohio) led 13-10 after the first quarter of play, and extended their lead to six points early in the second quarter. Meigs (0-7, 0-2) finished the first half with a 16-7 run, however, giving the guests a 26-23 lead at the break. River Valley started the second half with a 11-2 run and led 34-28 with 3:37 left in the third period. 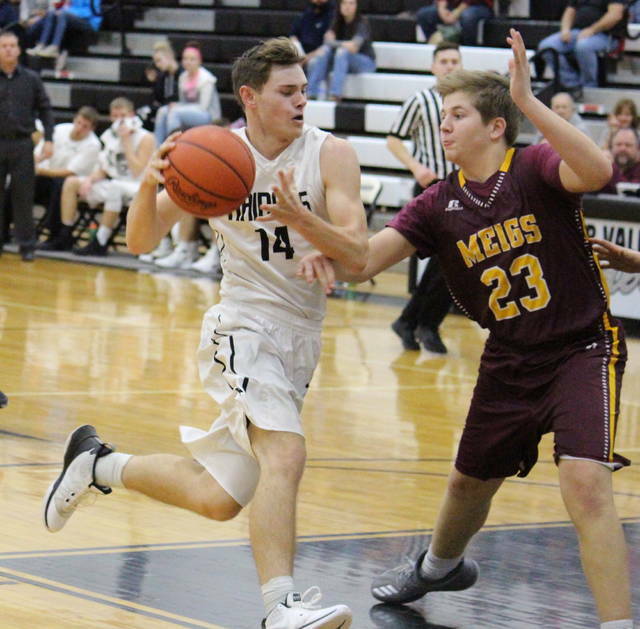 RVHS was held scoreless for the remainder of the stanza, however, as the Marauders rattled off nine straight points and headed into the finalewith a 37-34 lead. After the Silver and Black cut the margin to one point at the start of the fourth, the Marauders extended their lead to 41-36 with 4:30 to play. The Raiders made it a one-possession, at 41-39, with 4:25 left, but didn’t score for over three minutes. 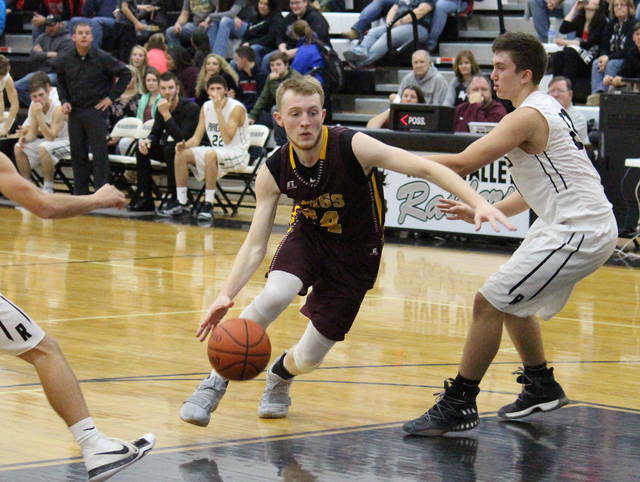 Meigs managed only two free throws during the RVHS drought, and the Raiders cut their deficit back to two points, at 43-41, with 30 seconds to play. On the ensuing inbound play, RVHS senior Patrick Brown picked off a Marauders’ pass, dished the ball to Fitch, who found Dustin Barber underneath for a the game-tying bucket. 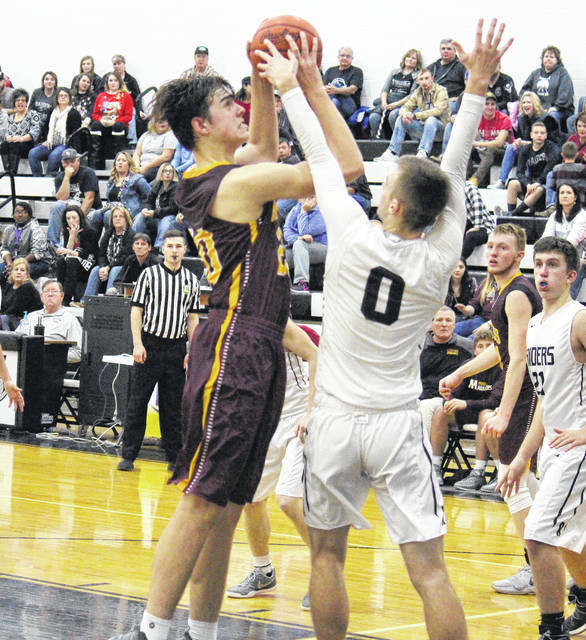 Meigs junior Zach Bartrum brought the ball up the floor and, with four seconds left in regulation, hit a contested jump shot from the lane, giving MHS a 45-43 advantage. After a timeout, the Raiders had the length of the floor to cover with three seconds on the clock. Brown inbounded the ball to Jarret McCarley near midcourt, and he found Fitch in the right corner. Fitch — who finished with team-high 18 points — sank the three-pointer, giving the hosts the 46-45 win. 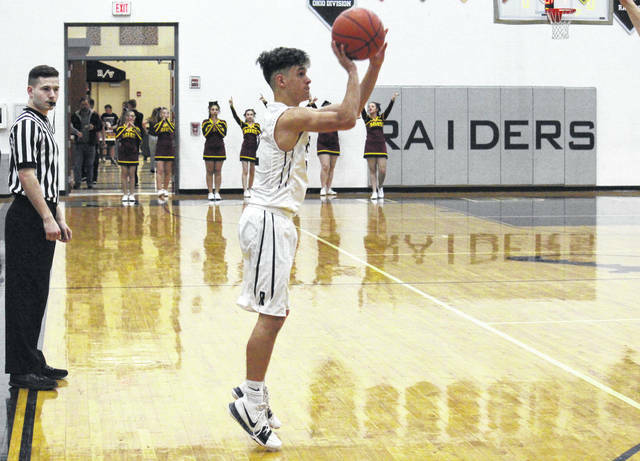 The Raiders shot 18-of-45 (40 percent) from the field, including 8-of-21 (38.1 percent) from beyond the arc, while MHS was 13-of-37 (35.1 percent) from the field, including 4-of-8 (50 percent) from beyond the arc. From the free throw line, River Valley was 2-of-7 (28.6 percent) and Meigs was 15-of-25 (60 percent). River Valley outrebounded the Maroon and Gold by a 27-22 clip, including 6-to-5 on the offensive end. Meigs won the turnover battle by a 17-15 tally, and held a 11-to-9 edge in steals. RVHS claimed an advantage of 11-to-8 in assists, while both teams blocked two shots. Following Fitch in the scoring column for the Raiders were McCarley and Barber with nine points apiece. Brown scored four for the Silver and Black, Rory Twyman chipped in with three points, while Chase Caldwell had two and Matthew Mollohan marked one. McCarley and Brown tied for a game-high with seven rebounds apiece, with McCarley also picking up a game-best five assists. Brown and Barber led the Raider defense with two steals each, while Brown and Mollohan both blocked one shot. Weston Baer led the Marauders 22 points on 10 free throws and five field goals, including a pair of three-pointers. Bartrum and Cooper Darst both scored nine points in the setback, with Darst pulling in a team-high six rebounds and Bartrum dishing out a team-best three assists. Christian Mattox scored four points for the guests, while Bobby Musser scored one point and grabbed five boards. Baer led the Marauder defense with three steals, followed by Musser with two steals and two blocks. These teams won’t meet again until the regular season finale on Feb. 16 at MHS. After hosting South Gallia on Saturday, River Valley will resume league play at Alexander on Tuesday. The Marauders return to the court on Tuesday at Vinton County, for their final of six straight games away from Larry R. Morrison Gymnasium.